May 16, 2016 By Elise 5 Comments This post may contain affiliate links. Please read my disclosure policy for more info. Say “Hi” to the newest of our gluten-free recipes. So delicious, and so easy! 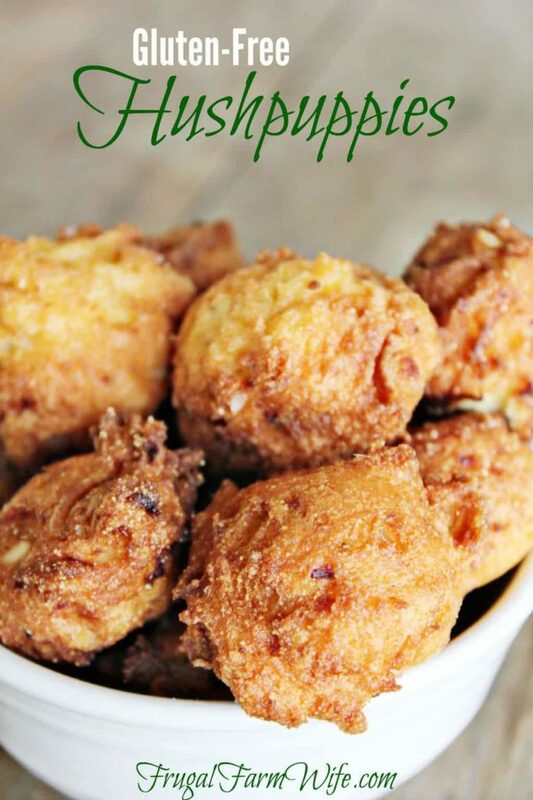 To say that I’ve never been a huge fan of hushpuppies is…. well, let’s just leave it at that. I’ve never been a fan. 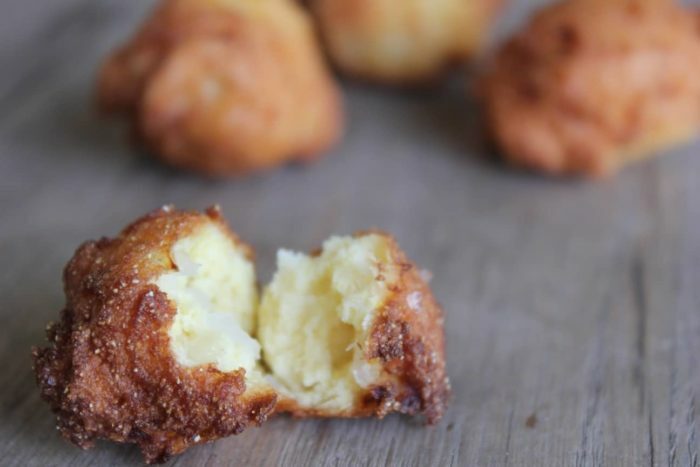 It’s not that hushpuppies are bad, I think it was just that the first time I tried one, it wasn’t what I was expecting. You know how that is, right? Especially when you’re a kid. You think there’s water in your glass, and it’s actually tea or soda, and it just tastes so wrong! I thought I was biting into something like a doughnut hole or corn fritter, and instead I got cornmeal and ONION!? Or at least for a lot of years. Buuuuuuut, I was making a good ol’ fashioned southern catfish dinner for the family the other day, and I knew that I couldn’t just not make hushpuppies because of my own bad experience, when I knew that they would enjoy them. So fine. I’ll make hushpuppies. You know what? They were actually pretty good. I guess it helps knowing what to expect. Chopping your onions up as finely as you can helps the flavor blend into the dough without getting big chunk of onion that may or may not still be crunchy (I like onions, but NOT crunchy onions! ), and the little bit of added sugar really brings out the sweetness of the onions. And no, your friends will never know they’re gluten-free! So. Not bad at all – despite the presence of large amounts of cornmeal! (I know, I know, what a way to “sell” your recipe). 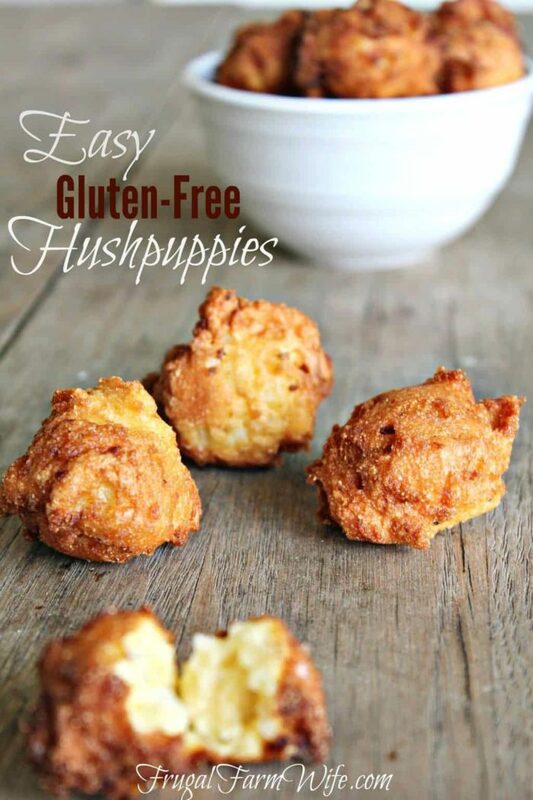 If you like hushpuppies, you’ll LOVE these! Combine eggs, sugar, and onions in a large bowl. Combine dry ingredients in a smaller bow, and add add to egg mixture. Heat deep fryer or a kettle of oil at least two inches deep over medium-high heat. Once oil reaches 350-375º, drop hushpuppy dough in by heaping teaspoonfuls. Turn once, if necessary (sometimes they roll themselves), once the bottom has become golden-brown. Remove from oil onto paper towels to drain grease. Serve with hushpuppy dipping sauce. I LOVE hush puppies! Always wanted to try and make them gf, now that you’ve done the recipe work I’m so making these! These are delicious! I used double the cornmeal and used 1c of a gluten free all purpose blend i make. I also added about 1/2 tsp salt. I dropped forkfuls in my deepfryer. YUM! I was told best hushpuppies ever by non -gf folks! yay! So glad they turned out well for you! I really enjoy your recipes. Thank you for posting.